Altrusa International, Inc., of Washington Court House has awarded scholarships for more than 20 years to two outstanding female graduates from each of the two public school systems. Shown here is Washington High School graduate Anna Nestor, who plans to major in psychology at Ohio University. Holding the symbolic $500 check are (center) Altrusa Vice President Elaine Crutcher and (right) Altrusa Foundation Treasurer Nancy Mowery. The second female receiving a $500 check from the local Altrusa club is Miami Trace graduate Samantha Ritenour, who heads to Marietta University in a few weeks to study athletic training and to play volleyball at the university level. Again, holding Sam’s symbolic scholarship check are Altrusa Club officers Elaine Crutcher and Nancy Mowery. 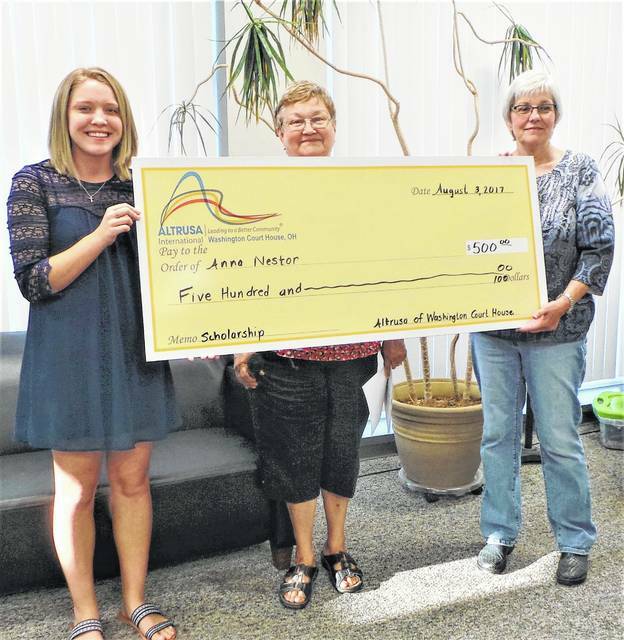 https://www.recordherald.com/wp-content/uploads/sites/27/2017/08/web1_20170803_190746.jpgAltrusa International, Inc., of Washington Court House has awarded scholarships for more than 20 years to two outstanding female graduates from each of the two public school systems. Shown here is Washington High School graduate Anna Nestor, who plans to major in psychology at Ohio University. Holding the symbolic $500 check are (center) Altrusa Vice President Elaine Crutcher and (right) Altrusa Foundation Treasurer Nancy Mowery. 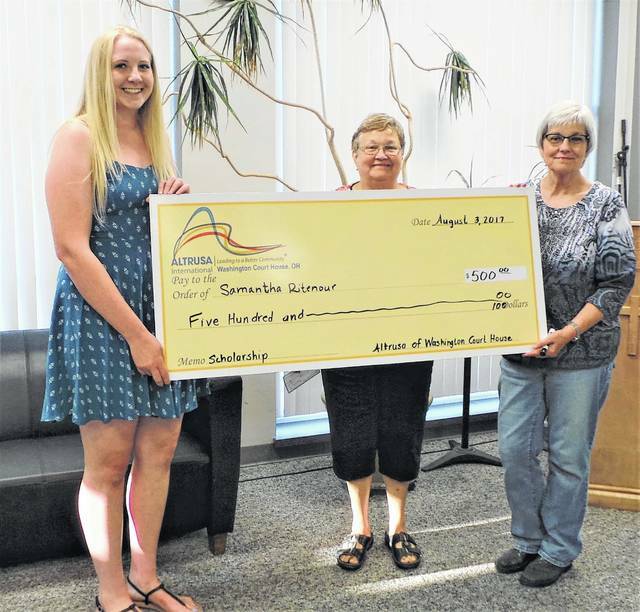 https://www.recordherald.com/wp-content/uploads/sites/27/2017/08/web1_20170803_191044.jpgThe second female receiving a $500 check from the local Altrusa club is Miami Trace graduate Samantha Ritenour, who heads to Marietta University in a few weeks to study athletic training and to play volleyball at the university level. Again, holding Sam’s symbolic scholarship check are Altrusa Club officers Elaine Crutcher and Nancy Mowery.